The famous London gallery has teamed up with the Tsukanov Foundation to promote art from post-Soviet states in London. A new five-year partnership between the Saatchi Gallery and a Russian cultural foundation is poised to bring fresh artists to London audiences though a series of exhibitions. 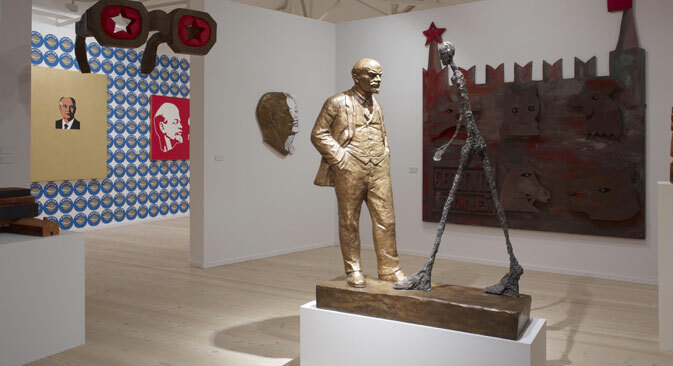 The Tsukanov Family Foundation, which collects non-conformist works from late-Soviet Moscow, staged the show Breaking The Ice: Moscow Art 1960-80s at the Saatchi Gallery earlier this year. The foundation also supports educational and cultural programmes in the UK and Russia. Igor Tsukanov, who is based in London, calls the city “undoubtedly the world art capital”. He recently told RBTH that he hoped the new collaboration with the Saatchi Gallery would see artists from the former Soviet Union “properly represented in the global art landscape”. Breaking The Ice claimed to be the first major UK exhibition of post-war Russian art and was a comprehensive look at a group of artists who have had relatively little exposure in London so far. The idea for the partnership emerged “almost immediately after the closing of the two Russian exhibitions held this year at the gallery. Both the gallery and myself were quite impressed by the level of interest from public and press to these shows,” says Tsukanov. Breaking The Ice attracted more than 600,000 visitors during its three and a half months run. The project kicks off immediately with a short exhibition of contemporary Ukrainian artists this month and the gallery is planning a huge joint exhibition with the Tsukanov foundation that will take over the entire space in late Autumn 2014. The massive, multi-floored Saatchi Gallery is certainly a good venue for this kind of innovative plan. Hurst points out that it is “fairly unique in offering a privately owned museum-scale gallery space with a team that is used to reacting quickly to new developments in contemporary art”. The gallery’s flexibility, compared with public institutions that operate at a slower pace, is also something Tsukanov appreciates, making it “much easier to approach and deal with new, fresh ideas”. Igor Tsukanov began collecting Russian art in 2000 with avant-garde paintings from the early twentieth century, but quickly found “it was impossible to build up a recognisable collection of these artists” because the museums owned all the best pictures and “the market supply is limited”. Tsukanov told RBTH that, with the exception of the Zimmerli in New Jersey, “there is no Russian or international museum… that possesses a world class collection of the second Russian avant-garde from ‘60s-80s and I decided to build up the most important collection of this period with a view to converting it eventually into a museum collection”. The foundation now holds the world’s biggest collection of works by at least six artists from the chosen era. “Of course, to achieve that level of representation I was buying the best pieces almost regardless of price sometimes,” Tsukanov said describing “very tough competition at the auctions” but feeling that the expense was ultimately justified. Will you visit this exhibition? Share your opinion in the comment section below!